Toroidal Volume Ion Source (TORVIS) - National Electrostatics Corp. The NEC Toroidal Volume Ion Source (TORVIS) is our highest current source for negative ions of hydrogen, deuterium, and helium. It is designed for efficient injection into tandem electrostatic accelerators. The TORVIS is a high current H–/He– ion source with a toroidal discharge chamber. Negative protons are directly extracted from the source. 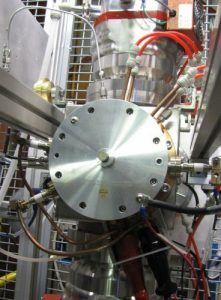 For negative helium production, a rubidium vapor charge exchange cell is used. 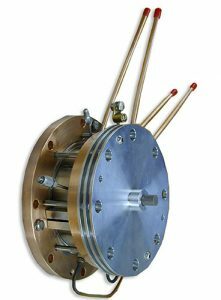 The TORVIS is a compact vacuum chamber that is completely surrounded by small permanent magnets arranged to create a surface of magnet cusps. These cusps serve to mirror the ions and electrons away from the walls of the chamber. A central magnet is placed on the back plate of the ion source directly opposite the beam exit aperture. This produces a conical region containing slow electrons. The fast electrons are filtered out of this volume, reducing destruction of the negative ion. A TORVIS injector system can be configured in three different ways depending on the desired beam species. The simplest version is optimized for H– isotopes (both protons and deuterium) and is a source of negative ions only. Another version optimized for He– is a source of positive ions only, with a charge exchange cell to produce the negative helium beam. The injector can also be configured for both H– and He– beams, including the charge exchange cell. Measured after mass analysis, the H– version produces currents of 400μA for proton beams, or 200μA for deuterium, while the He– version produces currents of 20μA. The combined version produces currents of 100μA for proton beams (50μA for deuterium) and 20μA for helium beams. Test beam currents are conservative with emittance for efficient transmission through tandem electrostatic accelerator.